The author of Power!! (called Girl Got Game by the English licensee) brings to us another high octane romantic comedy with plenty of mis-understanding, abnormal girls and really, really funny faces. Yusa Chiemi is a normal high school girl, wishing for nothing more than a romantic relationship with a handsome guy… yeah right, this is Seino Shizuru we’re talking about. Chiemi is far from normal. Where as most shoujo manga show you a pretty protagonist to give you a good first impression, Chiemi enters full of bruises and cuts, and we’re told that she’s been suspended twice for beating boys up. No, she’s not a delinquent like many other shoujo protagonists, but a Defender of Justice!. As our Defender of Justice! is on the verge of being expelled, a teacher offers her one way to salvation – reform the man known as the “Black Devil of Nishi High”, Hirata Akifumi. In order to achieve that aim, she spin kicks him, which obviously is the best way to reform people, Chiemi-san. In a this-can-only-happen-in-manga ‘twist’, Hirata falls in love with her. There’s a lesson to be learnt here girls – spin kick the guy you want to go out with, then the next day they’ll come to ask you out. It really works; don’t ask me how I know, it’s a gut feeling. And so their story starts. Unlike most other shoujo manga (starting to see a trend here?) the story isn’t about how they get together, but how they stay together, which is a really refreshing change from most other shoujo’s “OMG LOL I’M SOOO NERVOUS GONNA CONFESS NO I MISSED MY OPPURTUNITY DOES HE HATE ME WTF LOL BBQ” for roughly 200 chapters. The art is very cute though the style is more reminescent of shounen than shoujo. The lines are mostly very clean and crisp, with character designs more along the line of a typical shounen manga. If not for the watery treatment of the pupils and the female protagonist, you could almost mistake this for a shounen manga. In fact, it reminds me a lot of Pretty Face, with its over the top presentation and a cute but violent protagonist. Seino’s use of funny expressions and over the top presentation brings out most of the humour, usually used in contrast with a serious situation. Watching Chiemi and Hirata stare lovingly at each other, then suddenly having one or both of their faces transform into a really ridiculous expression never ceases to be funny. It might get repetitive for some though, since it’s essentially the same thing over and over again, although in different situations. That isn’t to say that the situations aren’t funny in and of themselves, but the expressions are what makes them extra-funny, so the jokes might or might not work for you the third or fourth time you read it. Having said that, I have very little doubt that Jun’ai Tokkou Taichou would get at least a chuckle or two the first time it’s read. It’s not all about humour and laughter though. The serious parts can be quite touching, but by no means is it a tear jerker. When they argue and have fights it’s hard to really feel the desolation because it’s surrounded by so much humour, but when they make up it’s very cute and sweet. It does work quite well altogether, but it’s not what you would read Jun’ai Tokkou Taichou for. After reading 4 chapters, my conclusion of Jun’ai Tokkou Taicho is this: it’s an excellent romantic comedy, with a good balance between the romance and comedy. It’s not heavy or depressing, and it’s a real pleasure to read – well drawn, laugh-out-loud funny, and very, very sweet. If you liked Power! !/Girl Got Game, it’s a must read. To everyone else, give Jun’ai Tokkou Taichou a shot, unless you’re emo and hate everything that brings laughter to this world. Just go cut yourself already. I don’t think Girl Got Game is the english name for this manga. Girl Got Game seems to be a different manga also by the same mangaka. At least, the description of “Girl Got Game” is nothing like what you’ve got here. This isn’t Girl Got Game… Girl Got Game is the PREVIOUS work by this mangaka. This is my favorite manga so far. It made me laugh on every page. I can stare at their funny faces for 10 minutes without turning a page and keep laughing on. Pfft! Haven’t read it yet, but I’m totally reading it! Roflmfao! Btw, I have the collection of ‘Girl Got Game’ [Hilarious]! Isn’t the name of this book; Junai Tokkou Taichou? Haha…I love this manga too, it’s like SUPER funny. I really like Hirata and Chiemi and her blackmailing friend, Yukari (sp?). Her father is super funny too =). It’s a total new feel from the cliche, stereo-typical Shoujo Manga, lol, it’s one of my favourite manga. Although it’s a funnily “violent” book, the Chiemi-Hirata pairing is very sweet and cute xD (The so-called love btw them is very innocent and naive, as the title suggest. Junai means innocent love). Pretty Face is nice too, but I prefer Junai. Currently I’m reading the chinese version and had just finished volume 6. Hello! I want to read it but where? Im kinda embrassed asking that but Im a newcomer on this site…Cause I really want to read it!! After reading Seino Shuzuru’s other series I simply had to read this one too, and now it’s one of my favorites. It even surpasssed Girl Got Game which takes quite a lot of humour to do. I love this manga! Actually it’s called Love Attack! 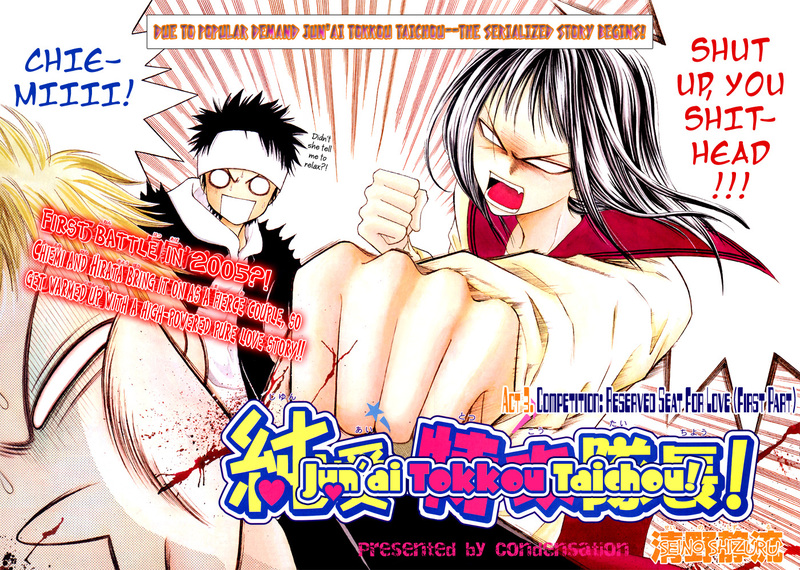 there is a chinese version of junai tokkou taichou? No the Japanese name is called junai tokkou taichou for whoever put that it was actually called love attack .i mean sure thats just the English name but the real name is junai tokkou taichou!! I’m afraid to read it because they didn’t translated it all.